It was my initial intent to climb Arc Dome (11,883') from the east. Two other persons joined my scheduled lead for this ill-fated effort. They most likely would not have made the climb, but I had no choice with whom I would really wish to have attend my trips. We left town Friday, and camped along U.S. 50 somewhere. 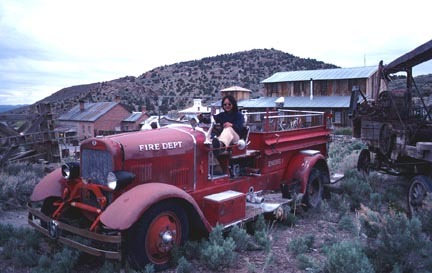 After an early breakfast in Austin, Nevada, we drove south on NV 376 through the Big Smoky Valley to search for the trailhead for the South Twin River. I took the wrong dirt road, and we had to climb over barbed wire fences to realize my error. This cost us time. We then found the trailhead. The hike up the South Twin River canyon was nice, and pretty, with high rock walls and narrows. A old dirt road led up the canyon, then turned into a signed trail. We went a little further to a meadow with an old log cabin. A huge, stubby rock pinnacle stood high overhead. There wasn't time to climb the peak. We were still a long way away. I found that I had forgotten to reset my camera upon changing from film to different film. I had been distracted by my company rushing along ahead. That upset me to be put into a bad mood. The next day we explored old mining towns Belmont and Manhattan on the south side of the Toquima Range. There was lots of history here. We had fun exploring the ruins. This was quite far from the holiday weekend crowds, but was still worth the 400 mile, one way, drive. The locals were curious about who would come all this way. The weather had been overcast. Some slight rain fell. I had planned to never come back here again, but, as fate would have it, I returned another time to climb the peaks. I shot pictures of a large brick smokestack, which was used for the smelters. Various minerals were extracted from the rock here. I have been fascinated by the expansiveness of the Big Smoky Valley ever since I have seen it. To me, it's like the Black Rock Desert for most others. There is no big number of homes, except for the one small town, Carvers. It is a massive flat of sagebrush, and I can't help but use the photo opportunity. I was intrigued by the clouds, whether they be completely overcast or not. This valley is some 70 miles long. From the north, you can't see the other end due to perhaps a rise in the horizon line. There is no river that runs through it. The peaks rise to over 11,000 feet on both sides. The general elevation of the floor is under 6,000 feet. 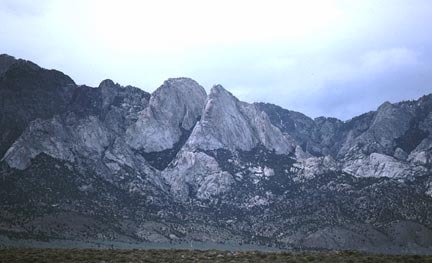 In the Toiyabe Range, about mid-way down the valley, is a mass of granite crags. They look tempting for a rock climber seeking some firsts. I keep a lookout for such opportunities. On our way home, we were arguing and generally having a bad time. I was very upset about losing my film. We stopped again near Austin, NV, as I tried to retrieve some of the lost opportunities. Austin is a gold and turquoise mining town. I know when I'm here I'm usually having a great time. We went to nearby Stokes Castle, which was built by an early mining baron for his British bride. We had some sun for photos. I couldn't wait to resume my regular life. I noticed the BLM Grimes Point Archaeological Area as we approached Fallon, and made a stop to investigate. A dirt parking lot and official trail serve to educate people about the sparse, scattered petroglyphs on rocks in the area. These rock art figures are said to date back 10,000 years. I took pictures of every one that I could find. There aren't many here, compared to other glyph sites. I had one hiker take my photo, with my Nikon, of the best examples that I could find. I think my mood showed. Recently, more trail development has been done at Grimes Point. There is now another signed trail to some caves and more glyphs, and another parking lot to go with it. There are thousands of glyph sites throughout the state, and the West in general. Further east, Hickison Petroglyph site is a better example, just east of the Smoky Valley. It is a half mile off U.S. 50 at the end of a signed dirt road. There is plenty to explore in Nevada, and one could make a lifetime of doing such.